For the second year in a row, the City of Reidsville has received the coveted American Association of Retirement Communities’ “Seal of Approval”. And in doing so, Reidsville remains the only municipality in North Carolina to earn the award, putting the City in a class by itself among North Carolina Certified Retirement Communities. AARC, a not-for-profit professional organization established in 1994, supports the efforts of states and municipalities, community developers and for-profit businesses who market to retirees. A recognized thought-leader and center of research, AARC provides innovative ideas from the people and organizations driving success and change in the retiree attraction industry. Reidsville received the State’s Certified Retirement Community status in 2015, only one of 18 cities currently in North Carolina. To receive this certification, a municipality must meet strict criteria with offerings that appeal to those looking to retire and beginning the next phase of their journey as they seek to relocate. Among the factors taken into consideration are affordability, cost of living, healthcare, continued education, lifestyle and a sense of community. As a Certified Retirement Community, Reidsville staff travel with the State promoting the City and its attributes. 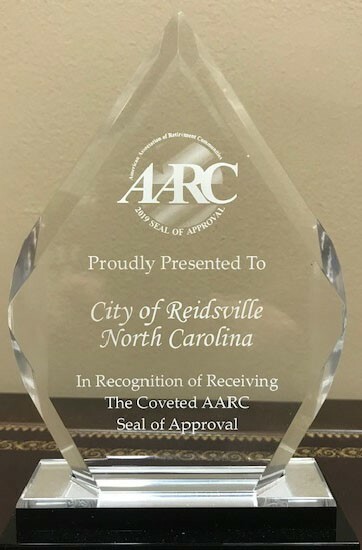 Only 23 such Seals of Approval have been awarded by the AARC across the United States, lending national recognition of Reidsville’s qualities to attract retirees.